Meatballs In Sauce 24 oz. 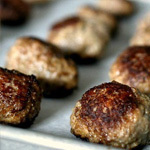 10 of our delicious Meatballs are combined with our classic homemade Marinara Sauce. Perfect for meatball subs or as a complement to a pasta dish.